7/30 Cup of Coffee: Portland swept a doubleheader on Saturday, receiving big days from Michael Chavis, Jeremy Barfield (pictured), and Henry Urrutia and a complete game by Trey Ball. Hector Velazquez struggled in a loss for Pawtucket, despite a solid game by Sam Travis. Salem split a doubleheader, with Roniel Raudes taking a tough loss. Starting pitcher Jhonathan Diaz was great for Greenville, who won on a walkoff home run by Ryan Scott. 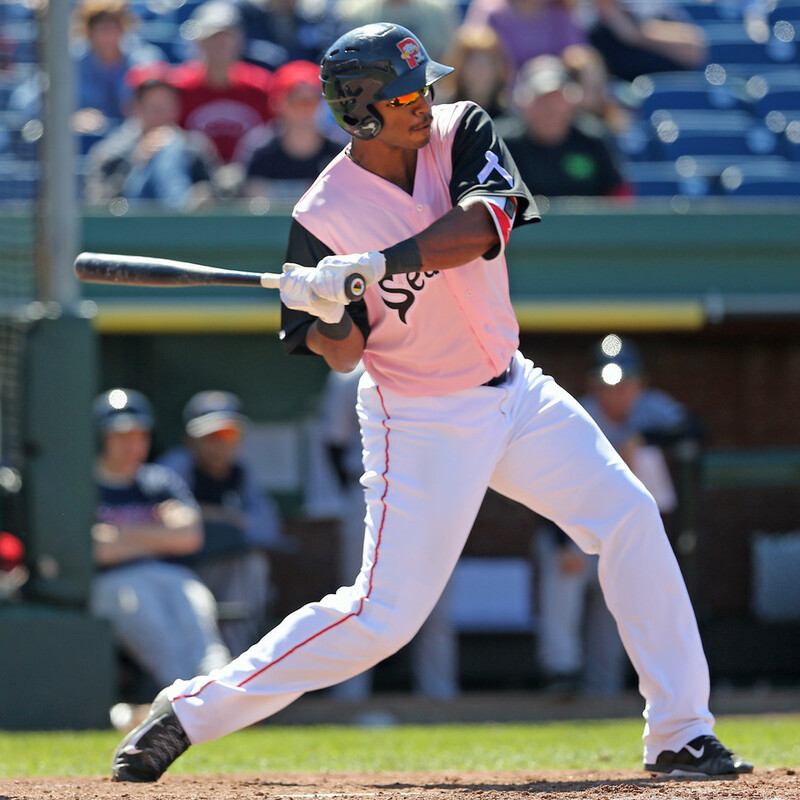 The bats exploded in Lowell as Yoan Aybar and Brett Netzer carried the offense in a win. With David Price hitting the disabled list and Doug Fister struggling, the Red Sox may need someone to step into the rotation from the minors. Hector Velazquez is a candidate to be that guy but he struggled on Saturday night, allowing five runs on eight hits in five innings. Edgar Olmos tossed two shutout innings and Jamie Callahan threw one in relief. Ryan Court was the offensive standout, going 3 for 4 with a double, walk, and two runs. Sam Travis was 2 for 5 with a double and a run. The Portland lineup exploded in the first game of the doubleheader, scoring nine times on 13 hits in just a seven-inning game. Michael Chavis went 1 for 3 with a two-run homer and a walk. First baseman Henry Urrutia was 1 for 3 with a walk and slammed a three-run blast. Josh Tobias paced the team with a three-hit game, bringing his average to .273 in Portland. Dedgar Jimenez started on the hill, allowing three runs in five innings. Williams Jerez closed out the win with two shutout innings of relief, fanning one. The Sea Dogs kept the good times rolling in game two, which was rescheduled from a rainout on Friday. Trey Ball threw a complete game, allowing three runs in seven innings with seven strikeouts and a walk. Right fielder Jeremy Barfield had a huge game, going 2 for 4 with two home runs, three runs, and three RBI. Henry Urrutia hit his second three-run homer of the day in the fifth inning, part of another 1-for-3 game. Shortstop Chad De La Guerra reached base four times, going 2 for 2 with two walks. Starting pitcher Roniel Raudes was rolling on Saturday afternoon before a five-run fifth inning. Only two of the runs were earned as Raudes also allowed six hits in his five innings of work, striking out and walking two. Marc Brakeman allowed a run in two innings, walking and punching out three. Tate Matheny had a solid game from the leadoff spot, going 2 for 3 with a double, a walk, and a run. Jose Sermo went 1 for 2 with a walk and his tenth home run of the season. The Salem bats jumped out in front with a six-run third inning and never looked back in game two of the doubleheader. Victor Acosta capped the inning with a two-run homer, his second with Salem. Josh Ockimey was 2 for 2 with a double, walk, and run. Austin Rei was 1 for 3 with a double, a run, and an RBI. Kyle Hart picked up the win with five innings of three-run ball, striking out six and walking three. In relief, Austin Glorius allowed an unearned run in an inning and Adam Lau threw a scoreless frame. Starting pitcher Jhonathan Diaz was dominant on Saturday night, allowing one unearned run on four hits in 5 2/3 innings, striking out eight and walking two. Pat Goetze threw 1 1/3 scoreless innings of relief while Matthew Gorst gave up a run in two innings, striking out three with no walks. Lorenzo Cedrola had a great game from the leadoff spot, going 3 for 3 with a double and an RBI. Ryan Scott won the game with a pinch-hit walkoff home run in the bottom of the ninth. The top of the lineup was on a roll on Saturday, as the top three hitters-- Michael Osinski, Yoan Aybar, and Brett Netzer-- combined to reach base nine times. Osinski reached base four times, going 3 for 4 with a walk. Aybar and Netzer showed off the extra-base power, with Aybar going 3 for 4 with a double and triple and Netzer 2 for 5 with a pair of doubles. Zach Sterry went 1 for 3 with a double and four RBI. Starting pitcher Nick Duron allowed a run in five innings, picking up his second win. Devon Fisher struggled mightily in relief, allowing five runs in 1 1/3 innings. Starting pitcher Angel Padron had trouble on Saturday, allowing five runs (four earned) on nine hits in three innings. Rio Gomez was great in relief, tossing three shutout frames with four strikeouts and a walk. Jecorrah Arnold had a big game, going 2 for 3 with a home run and two RBI. Everlouis Lozada went 2 for 5 with a double and a run. The DSL Sox received a huge game from their lineup, led by Rafael Rincones, who was 3 for 4 with a double, walk, and RBI. Catcher Marcos Martinez was a big run producer for the offense, going 3 for 5 with a double, two runs, and three RBI. Third baseman Luis Hernandez went 2 for 4 with two runs, two RBI, and a walk. Isaac Pinales started on the mound and went four innings, allowing two runs while fanning four and walking one. Player of the Day: Portland right fielder Jeremy Barfield showed out for both games of the Sea Dogs' doubleheader. In game one, he went 2 for 4 with two RBI and a run then had a huge game in the nightcap, going 2 for 4 with two home runs, three runs, and three RBI. The Red Sox signed Barfield from the Sugar Land Skeeters of the Atlantic League in May and he has been excellent since then, hitting .307/.374/.592 with 17 home runs for the Sea Dogs.